I purchased or received an audiobook. How do I download it? For the best listening experience, we recommend you download first to your desktop computer and add to iTunes. 1. From your desktop computer, click the download link on the order confirmation page to begin downloading the audiobook file. 2. Once the download is complete, double click the file, or open the file in your media player of choice. We recommend iTunes or Windows Media Player. How do I transfer the audiobook from my desktop computer to my iPhone? 1. 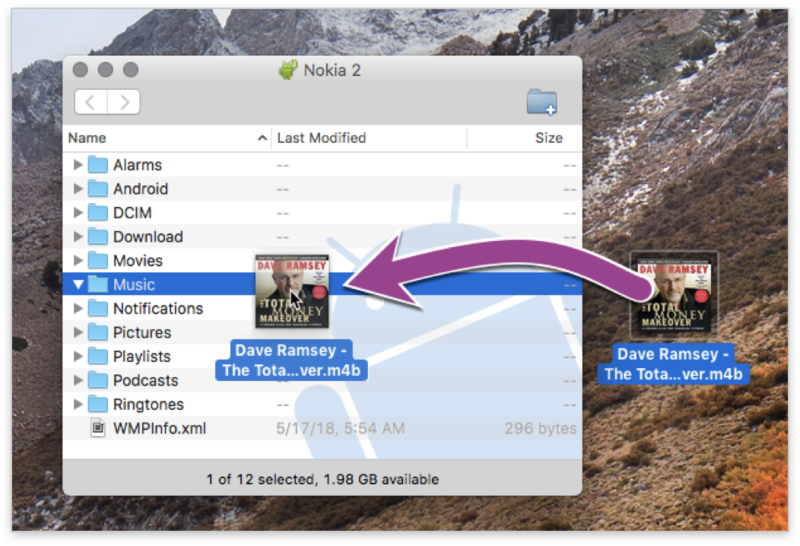 To transfer the audiobook to your iPhone, you'll need to use iTunes (for Mac or PC). 3. If the audiobook hasn't been added to iTunes yet, go to the "File" menu and choose "Add to Library...". Select the audiobook file that you downloaded. This is most likely in your 'Downloads' folder. Once selected, it should now appear in the Audiobooks section of iTunes. 4. Connect your iPhone to your computer with a USB cable. If prompted, on your iPhone, choose "trust this computer". 6. In the iPhone sidebar, click Audiobooks (1). Make sure "Sync Audiobooks" (2) s selected, and click Apply (3). 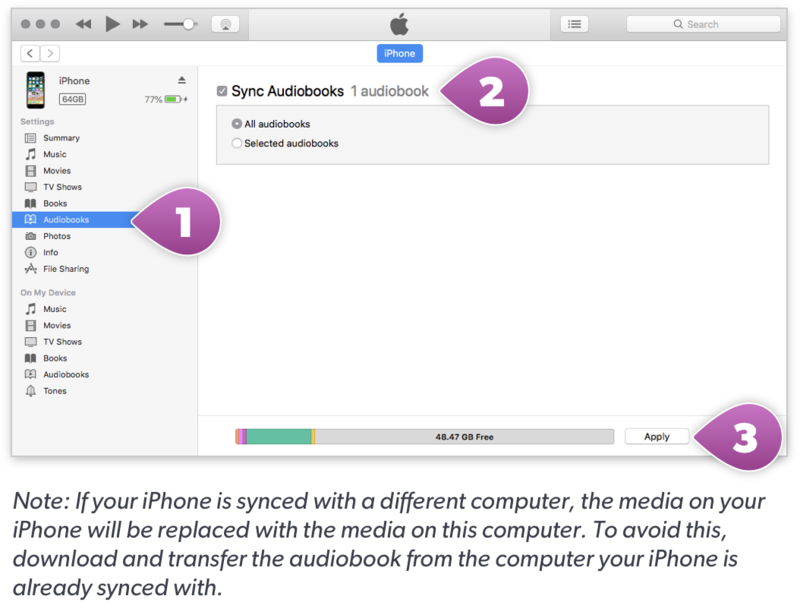 You may also choose to sync "Selected Audiobooks" and click only the audiobooks you would like to sync. 1. On your Android phone, click the 'click here to download link' on the order confirmation page or order confirmation email to begin downloading the audiobook file. Since is a large file, the download process may take up to 2 minutes. Many phones may not show the file is downloading so don't be alarmed if you only see a white screen while the file is downloading. 2. Once downloaded, the audiobook will be located under your Downloads on your Android device. Once the file is on my Android phone, how do I play the audiobook? 1. The easiest way to play the audiobook is to using an audiobook app. We recommend the free Smart Audiobook Player app in the Google Play store. You may be asked to upgrade to the paid version but the free version will work fine. 2. 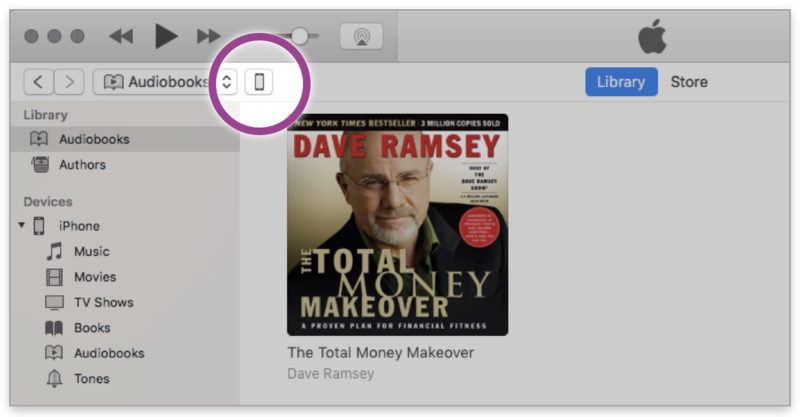 Once an audiobook player has been downloaded to your phone, allow app to access the media files on your device. If prompted to set up the root folder, select OK and choose the Download folder. If prompted to allow m4b files, select OK. When the app scans for the file, it should show up in your Library. If it does not show up after the initial scan, refresh the library again to look for the m4b file. 3. If you are unable to play the file from within the app, you can also try to play the audiobook file directly from your downloads. How do I transfer the audiobook from my desktop computer to my Android phone? 1. If your Android phone screen is locked, unlock it. 2. Connect your phone to your computer with a USB cable. 3. On your phone, if you are prompted to choose a USB connection option, choose "Transfer files" or "Media Device MTP" to allow files to be transferred. **If you are not prompted, on your phone, you will need to go to Settings > Connected Devices > Connection Preferences > Under 'Use USB for' select File Transfer. 5. If prompted to convert the file, click "Yes". 6. The audiobook is now in the "Music" folder of your phone. 7. The easiest way to play the audiobook is to use the Smart Audiobook Player app in the Google Play store. 1. Download and install Android File Transfer on your computer. The dowload is available at https://www.android.com/filetransfer/. Follow the instructions to download and install to your computer. ** **If you are not prompted, on your phone, you will need to go to Settings > Connected Devices > Connection Preferences > Under 'Use USB for' select File Transfer. 4. Open the Android File Transfer app. 6. The audiobook is now in the "Music" folder on your phone. Gifting an Audiobook? We'll send you a confirmation email with the link to download the file after purchase, and you can forward to the recipient! It's simple, easy, and much better than a gift card! Using your personal computer, open the email confirmation that contains the eBook. Use your USB cord to connect the Kindle to your PC/Mac. You should now see the Kindle appear as a removable storage device in the “Computer” section of the start menu (on a Mac the Kindle device will appear on the desktop). Drag and drop the file on your desktop to the “Documents” folder in the Kindle drive (The file might appear as a .MOBI or .PRC). Unplug your Kindle and open the “Library” section. The book is located under the “Documents” section. Open the email confirmation that contains the eBook. Right click on the Kindle eBook file and select “Save Link As” or “Save Target As”. 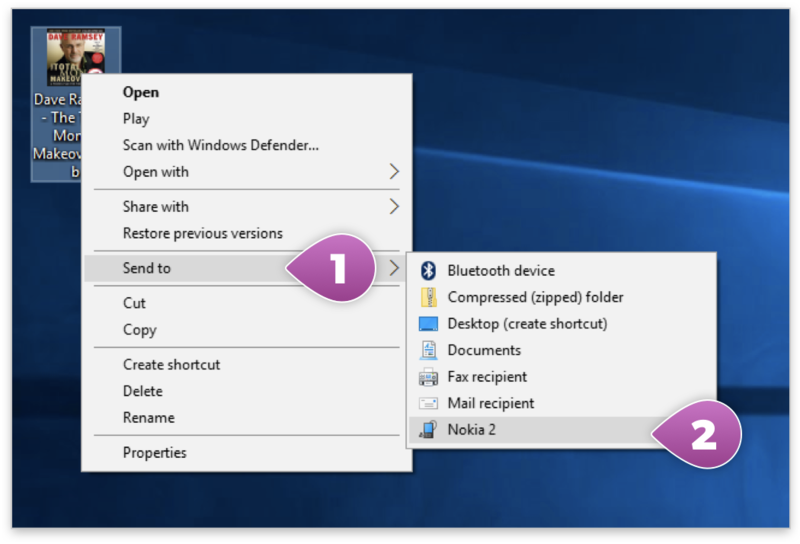 Change the destination location to “Desktop”, and then select “Save”. Double Click the eBook file on your desktop and it will automatically load in the Kindle reader. ** Make sure you have the Kindle app installed on your iOS device! 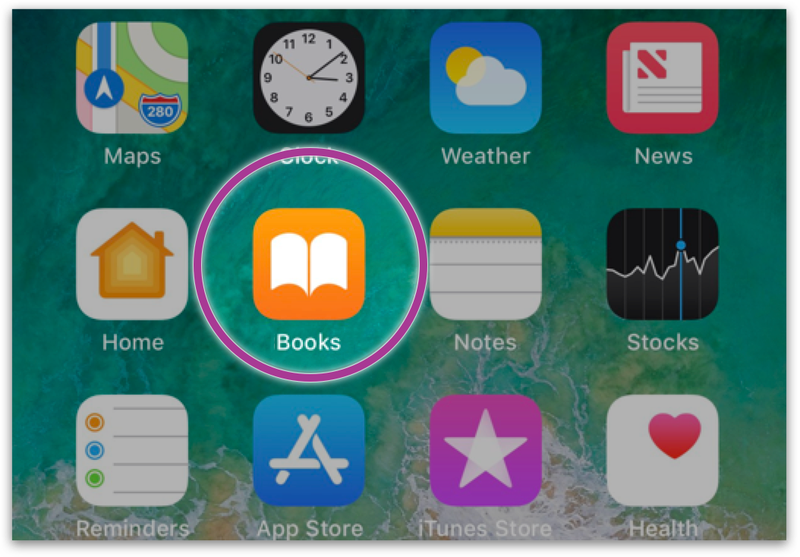 Open the email that contains the eBook file(s) in the Apple “Mail” App. Touch the file to download it. Once the file is finished downloading a new window will appear. Use your USB cord to connect the Nook to your PC/Mac. You should now see the Nook appear as a removable storage device in the “Computer” section of the start menu (on a Mac the Nook device will appear on the desktop). Drag and drop the .EPUB file on your desktop to the “My Documents” folder in the Nook drive. Gifting an E-Book? We'll send you a confirmation email with the link to download the file after purchase, and you can forward to the recipient! It's simple, easy, and much better than a gift card!